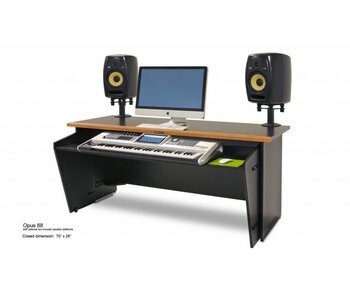 Simple and elegant furniture solution for keyboard based studio spaces. Placing your gear at the optimum height while providing proper sight lines and listening positions make Opus an ideal configuration for your workspace. With a unique sliding keyboard shelf, Opus protects your equipment and lets you maximize your available personal space and access as much, or as little, of the keyboard as needed. Cherry wood trim protects and enhances the aesthetic of Opus as you focus and create your best work. Like creating a song with a bass line and then building on it, by adding accessories to Opus you take a simple and profound idea and turn it into a commanding workstation with a powerful presence. Integrate ARGOSY Speaker Platforms, Monitor Arms, and more for your vital gear and transform your room into your Dream Studio.